So I perched on the side of a skating rink today, returning a PBeM log on BoF01 The Marco Polo Bridge Incident. Two IJA (Imperial Japanese Army) tin cans drove down the bridge on Turn 3 to stop the Chinese from threatening their rear. As the lead tin cans drove around the woods, a Chinese squad unconcealed and started up with their light machine gun (LMG). The range was 6 hexes. I needed to roll a 10 to hit. Moving target and the brief appearance added 4 to the dice roll (Case J), the size of the tiny Type 94 tank added 2 (Case P) .. I needed a 4 and I rolled 2,2! PPOONGGGGGGGGG!!! So I got a hull side hit where the armour’s zero. I needed another 4 or less to kill it (2 rolls of 4 or less is a 2.9% probability). It was a 1,2 – BOOM! 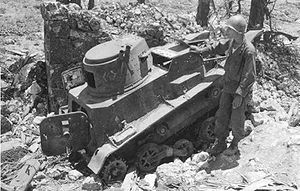 The Chinese LMG took out a Japanese tankette!! JUST HOW COOL IS TTTHATTTT? This entry was posted in Game Play and tagged Advanced Squad Leader, ASL, board wargame, board wargames, Hong Kong, Imperial Japanese Army, LMG, PBEM, tank, Type 94 tankette, VASL. Bookmark the permalink. Don’t you just love ASL? Brilliant Jackson! ABSOLUTELY Kevin – thanks for visiting! That’s as good as it gets. How is that scenario? I have been wanting to try it. Mark, I am still in the midst of it trying to break through the IJA defense and getting the bridgehead back. It’s quality versus quantity : a few IJA squads plus two tanks versus hordes of Chinese conscripts (plus some regulars) and an armored truck. The IJA can’t defend everything but the short range, low firepower and low MF of the conscripts makes it challenging in city fights. There are a good number of “Marco Polo Bridge” scenarios out there and I tried this one first as it seem to be the most balanced. It’s a good intellectual challenge, I’d recommend it! LMGs can be fired as ordnance? A9.61 AFV KILL: Unlike Small Arms Fire, a MG attack may conceivably destroy a poorly armored AFV during a fire phase by attacking it alone (i.e., not as part of a FG) on the To Hit Table (using the Vehicle Target Type) and the AP To Kill Table. Such an attack must be made within Normal Range of the MG, without any form of halved FP penalty imposed, and predesignated as an AFV To Kill attack vs a specific AFV. If hit in an unarmored Target Facing, the AFV is attacked on the ★ Vehicle line of the IFT instead of on the AP To Kill Table. If the resulting To Kill DR is < the Final Kill Number for that Target Facing the AFV is eliminated (and burning if ≤ half of the Final Kill Number), and if the To Kill DR equals the Final Kill Number the AFV is Stunned (even if BU; D5.34). See C3.8 (Multiple Hits), C3.9 (Location of Hits) and D3.54 (Vehicular MG Fire vs AFV) for related information. For some reasons that I can’t fathom right now, I always assumed that this excluded LMG specifically. I was living a lie. Thanks. It’s never too late for your thousands of games going forward! my British 4-5-7 with LMG killed a Stug III in the Badgers Breath. The arrogant Stug drove pass my picket to lineup a shot at the Badger parking adjacent. The to hit was a 7dr the TKdr was a 3, base 4 +2 point blank modified with a -1 rear target = 1 dead Stug. Some decent tanks must also beware.